These interactive field trip experiences are aligned with Kentucky and Indiana Core Content Standards and are developed for specific grade levels. 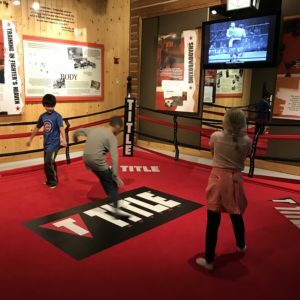 During a visit, groups will receive 45 to 60 minutes of classroom instruction and 60 minutes of activities and exploration of the Muhammad Ali Center’s exhibits. In addition, we offer pre- and post-visit lessons and teacher resources. What makes a champion? Are champions defined by success on the field, court, or ring? Or are champions distinguished by something much greater? During this experience, sports teams will take a motivational journey through the life and legacy of the Greatest of All Time, Muhammad Ali. Student athletes will leave inspired to strive for personal greatness both on the field and as leaders in their communities. Our self-guided visits include a structured 15-minute introduction with an education staff member. That introduction includes information about Muhammad Ali and his legacy. Please schedule three weeks in advance. We suggest that you allow approximately two hours for your visit. Please download and print the document Field Trip Policies and Procedures for Teachers and Chaperones and distribute prior to your visit. Helping chaperones know what to expect prior to the visit is essential for the overall experience of the children. 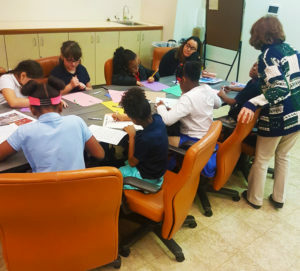 The Muhammad Ali Center welcomes home school groups. We require a 6:1 student/chaperone ratio for all school groups. Adult chaperones will be admitted free at a six to one ratio. Additional chaperones are welcome and will receive the $10.00 per person group rate. Each school group is required to fill out the Youth Group Interest Form prior to visiting.